You're using a smartphone, which means you should be able to do a lot of nice things you never could with your plastic remotes. Macros are AnyMote's solution to simplify repetitive actions that you do every day. Most importantly, macros can be used just like any other command. 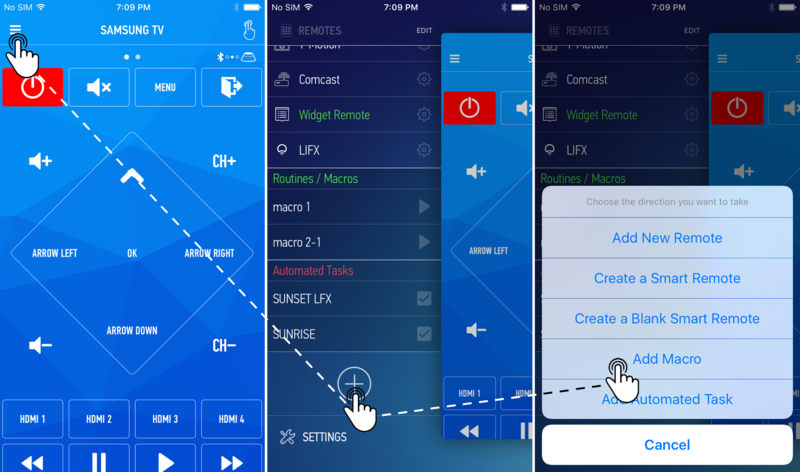 You can assign them to buttons, gestures, widgets, notification, automated tasks & more. Pick a short and representative name - that will avoid confusion later. 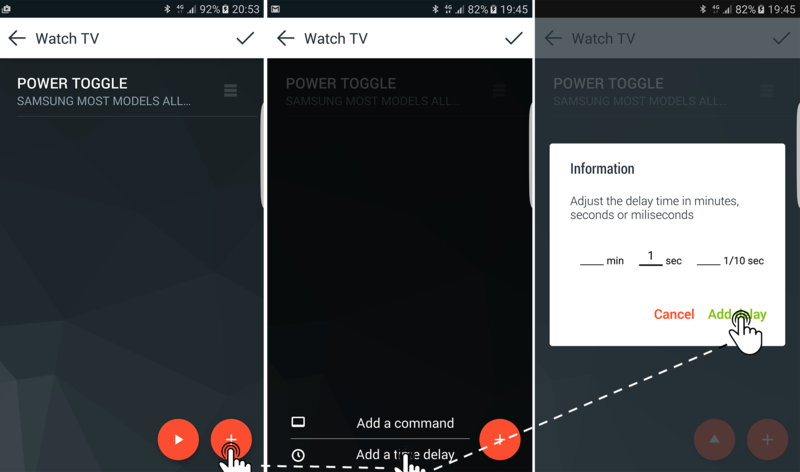 Since we're creating a Watch TV macro, what we actually want is to turn on both the TV and the Set Top Box. 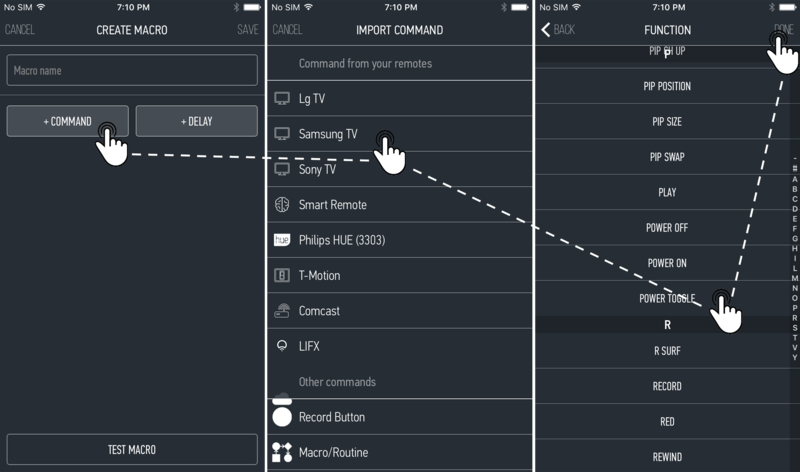 Tap the add command button, select your TV remote, and then scroll down and pick the Power On button. If you don't have a Power On command, pick the Power Toggle. Once selected, tap the upper-right side of the screen button to confirm your selection. Many devices are easily disoriented by commands that are sent too quickly one after the other. Since the AnyMote sends these commands very quickly, you'll want to add a delay between your first command and the next. Tap the add delay option, pick a delay of roughly 1 second, and then save it. Here's another real-life scenario: when you first power it on, your TV takes a few seconds to start up. That can be up to a minute if it's a Smart TV. During the boot-up time, the TV will ignore any command you send to it, so you'll want to add a delay of up to a minute between Power On and any other command, like INPUT HDMI 3. Congrats, you've learned the basics! 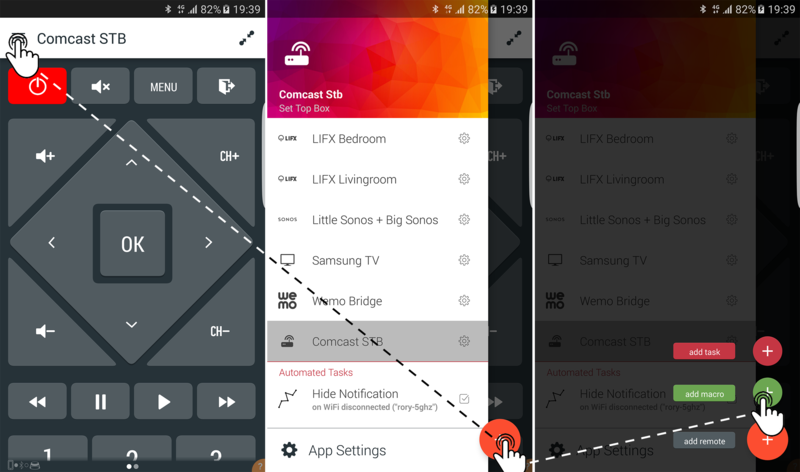 Now you'll want to import Power On command for the other device in this activity, your Set Top Box. 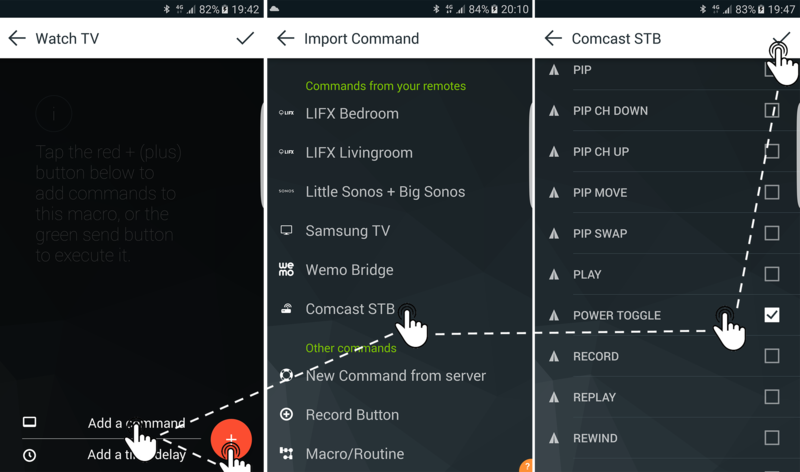 Just like before, pick the [add command] option, then select your STB and then its Power On or Power Toggle command. 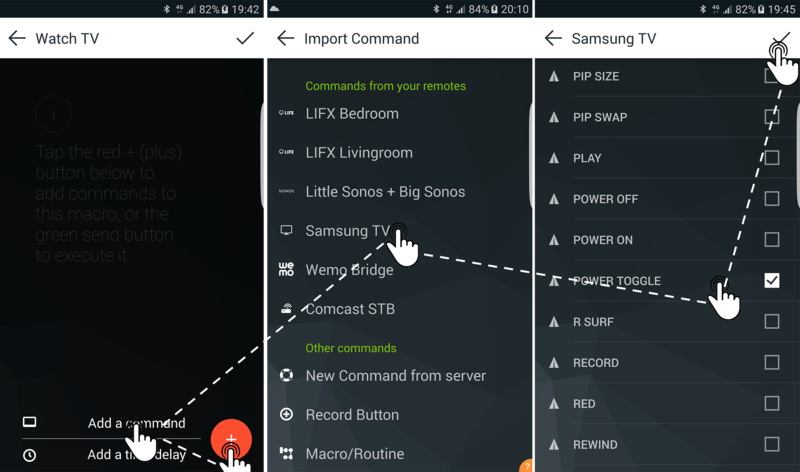 Feel free to import other commands as well, like Power On for your sound system, or the Input Hdmi 3 for your TV (assuming your STB is connected to HDMI 3 on your TV). The macro should now look like the first screenshot in step 5 below. 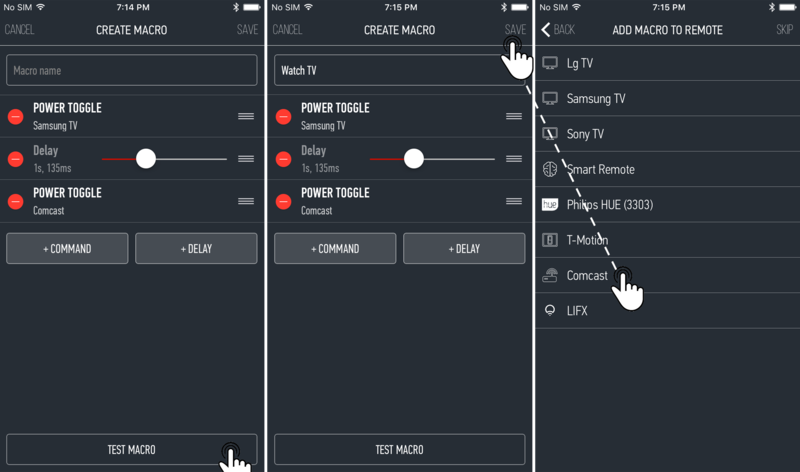 Once you've added some or all your commands to this macro, you can test it by pressing the [play] button. This is the time to adjust the delays if required, re-arrange commands by dragging the 3-bar indicator at the right of each row, or add even more commands. Once you're happy with the results, tap the checkmark / save button in the upper right side of the screen to save this macro. 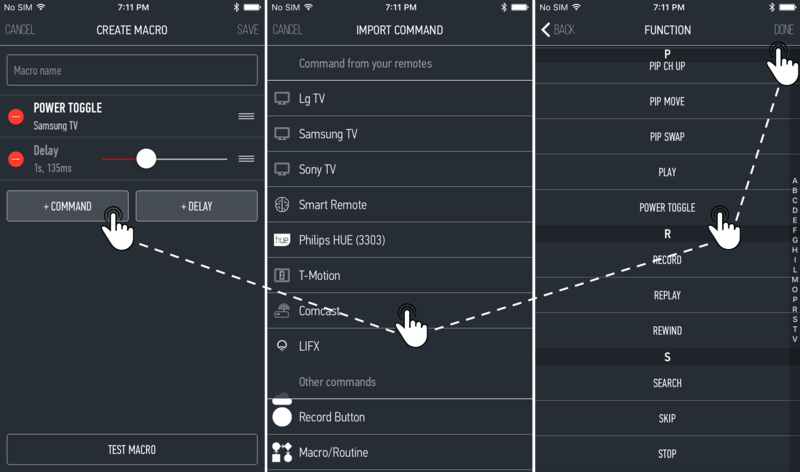 Optionally, you can also select a remote onto which the macro should be imported as a regular button. - use large-enough delays, but not too big. Usually 0.5s to 1 second works best. - feel free to get creative. 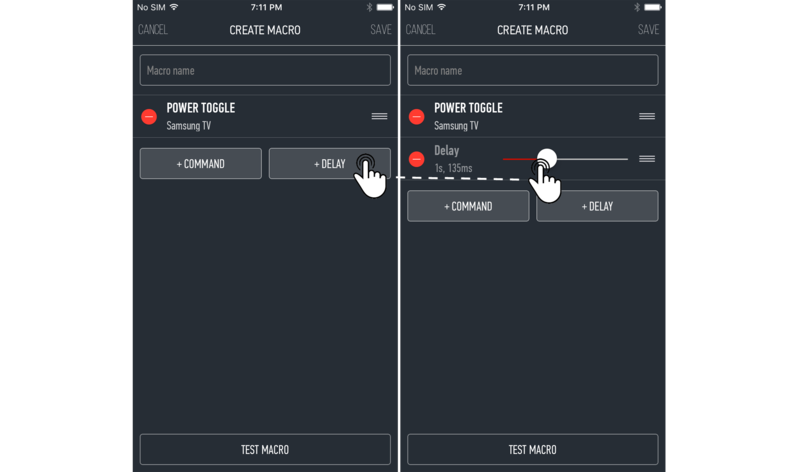 You can even import macros in macros! - use special commands. For example, once all commands are sent, launch the TV remote.